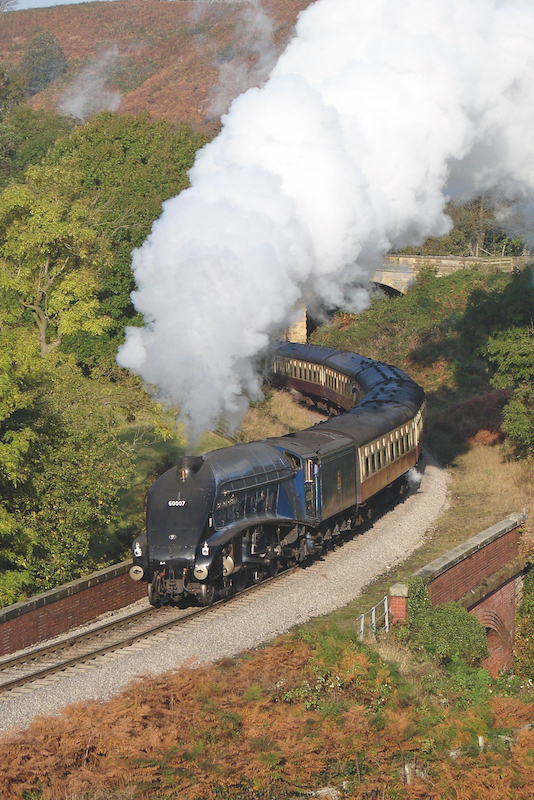 The North Yorkshire Moors Railway (NYMR) is rather different from the Keighley and Worth Valley line altogether. At 18 miles long, or 24 if you include the final stretch to Whitby, the line is arguably more about the scenery than the history. 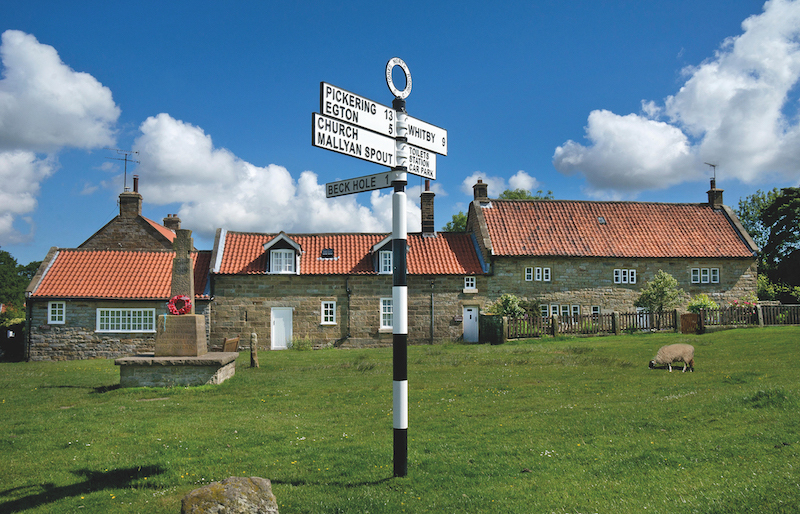 First opened in 1836, the then-Whitby and Pickering line was the culmination of efforts to revive the fortunes of the North Yorkshire port – with passengers travelling to York by stagecoach to connect to the main rail network. It was initially designed for use by horse-drawn carriages, but part of the line was too steep so a system of ropes and pulleys was devised to pull carriages up part of it. It was later converted into a double-track steam railway and, in 1854, a deviation line was built to tackle the problematic incline. The line faced severe cutbacks during the economic slump of the 1930s and the Second World War and, like the KWVR, it was also recommended for closure after a review into the country’s railway network by Dr Richard Beeching, with passenger services ending in 1965 and freight a year later. 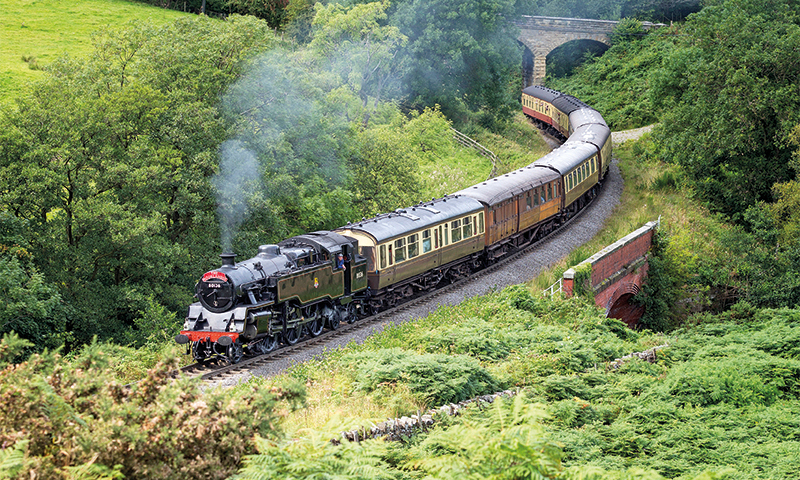 A group of enthusiasts fought to reopen the line between Grosmont and Pickering in 1967 and eventually, six years later, HRH Duchess of Kent officially opened what is now the NYMR. 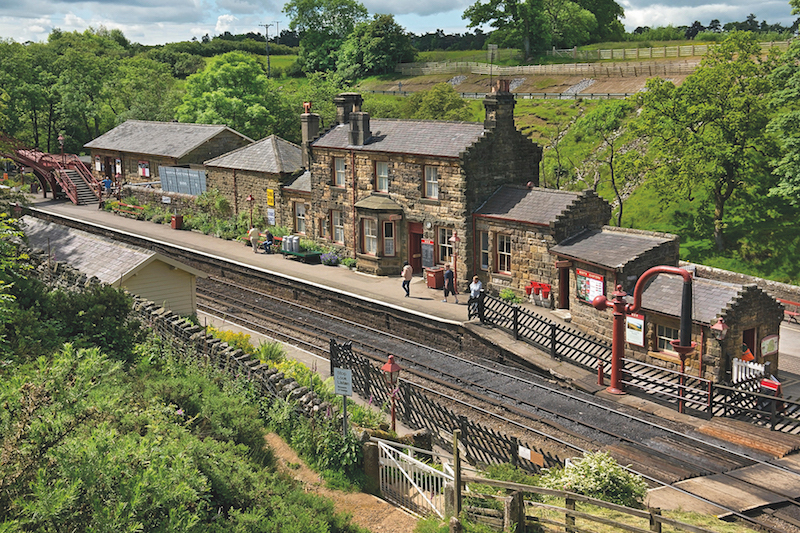 The line starts at the market town of Pickering, where the terminus is strewn with signs and signals from a bygone era, with an impressive roof and traditional tearoom. The train chugs away and, about 20 minutes later, passes the pretty station of Lewisham, at the bottom of the North York Moors, followed by the request stop Newtondale Halt. But it is the next station, Goathland, which is perhaps the most exciting, certainly for film fans. As the train pulls up and rounds the corner to arrive in the station, many will immediately recognise the scene as Hogsmeade from the Harry Potter films. Visitors disembarking here can walk up into the village, which also served as Aidensfield in the ITV drama Heartbeat for many years, and is scattered with sheep thanks to the Duchy of Lancaster’s common grazing rights. The penultimate stop on the line is Grosmont, home to the NYMR’s Engine Shed and an 1835 tunnel built by George Stephenson. This is where the heritage line meets the main network and about 30 minutes later, after winding along the River Esk, the train slowly pulls into the port of Whitby. 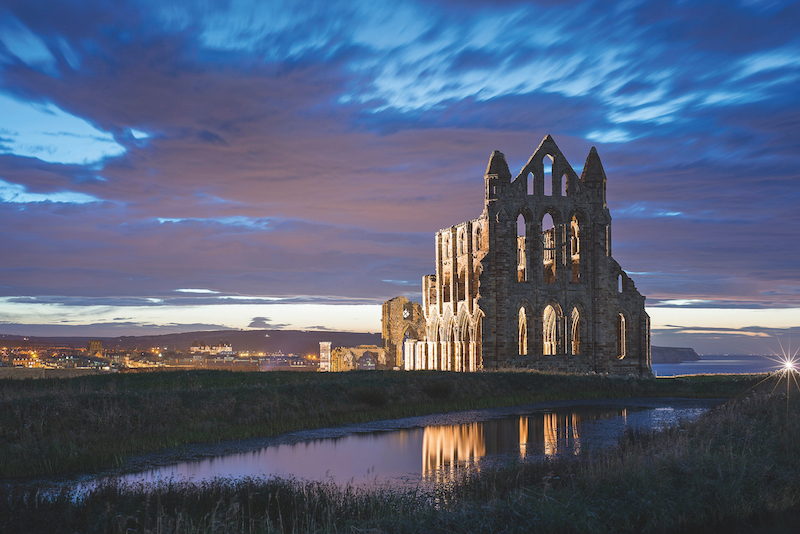 Whitby is truly one of the gems of the Yorkshire coast and you can’t miss the squawking of the seagulls and the smell of freshly-cooked fish and chips. It is a short walk from the station to the town centre, near where explorer Captain Cook served as a trainee with a local shipping firm and is now home to the Captain Cook Memorial Museum. The town steeply stretches up on either side of the river mouth and it’s worth exploring both halves. On the West Cliff is a series of arcades, a pier and, further up the hill, the town’s famous Whale Bone Arch, which provides a perfect frame through which to view Whitby Abbey on the other side of the harbour. Cross the swing bridge to the East Cliff and explore the shops selling Whitby jet (fossilised wood dating back to the early Jurassic era) before climbing the 199 steps towards St Mary’s Church, notable for its 17th-century wooden interior, and the adjacent ruins of Whitby Abbey, a former Benedictine monastery. The two settings served as inspiration for Bram Stoker’s Dracula, after the Irish author stayed in the town in 1890. The Abbey has greatly suffered from the ravages of time, nature and even a German naval bombardment in 1914 but makes for a fascinating visit at all times of the year. From the mill town of Keighley and the harbour of Whitby to rugged moorland in between, there really is something for everyone in Yorkshire. And what better way of exploring it than by rail?